When I head to the kitchen, I don’t always know what will happen. Yesterday, this delicious Vanilla Cake in a Mug recipe happened. I love it when something delicious…and easy…happens! It was so tasty I had it for my S breakfast this morning. In case you’re wondering, an “S” breakfast is one with lots of good, healthy fats and very few carbs. I’ve been a very happy and successful Trim Healthy Mama follower for over a year now, and I eat yummy treats like this just about whenever I want! 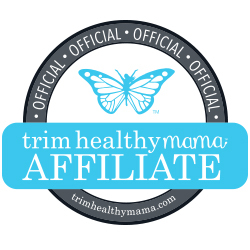 Read more in my reviews: Trim Healthy Mama Review, 90 Days of Trim Healthy Mama – A Progress Update, and My Trim Healthy Mama “Trimmaversary” – One Year Later. 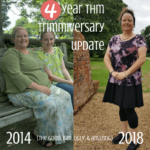 Or if you’re ready to join the thousands of THMs out there who have lost weight and gained good health, order the plan book and cookbook from my affiliate partner. I love coconut flour because it lends a “real” consistency to gluten and grain free baked goods. Plus, it’s super healthy for you! One thing I have noticed, however, is that using a significant amount of coconut flour in a mug cake recipe seems to increase the “baking” time. 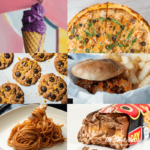 Since all microwaves vary, you may need to experiment a bit to see how long yours will take. My microwave takes about twice as long. Top your vanilla cake in a mug with your favorite Trim Healthy Mama plan-approved “frosting,” Greek yogurt and fresh berries, some THM Skinny Chocolate, or try this delicious fresh, creamy lime glaze. If you like coconut and mug cakes, you will want to try my Dark Chocolate Coconut Cake in a Mug – a recipe that’s included in the first Trim Healthy Mama cookbook published in 2015! 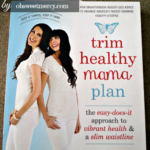 You can order your copy here, or the new simplified Trim Healthy Mama Plan book, through my affiliate partner. 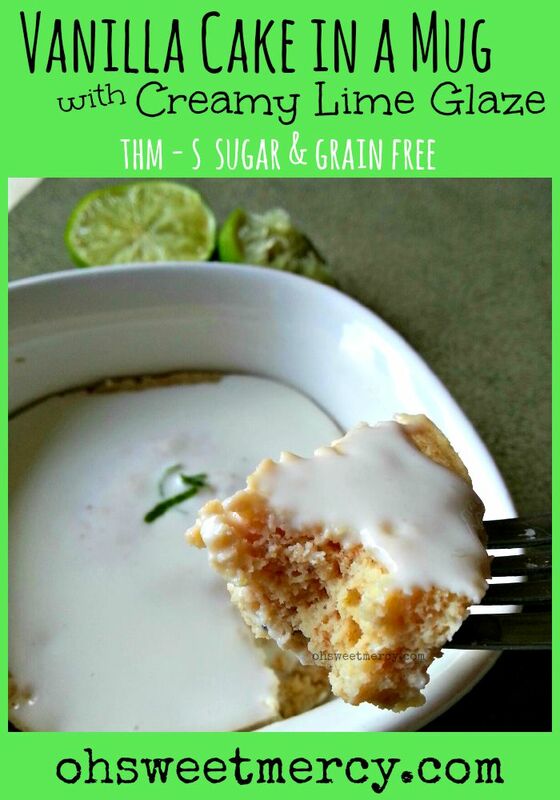 This bright, fresh, low carb single serving cake is a perfect treat for Trim Healthy Mamas, gluten free, or low carbers. 1 Tbs 0% Greek yogurt, or sour cream. Combine sour cream, fresh lime juice and sweetener(s). Mix well and pour on top of cooled, or warm, cake. Be Sure to Pin this Vanilla Cake in a Mug Recipe to Your Favorite Pinterest Boards! This was very good, a breakaway from the usual MIM, but what is the carb count, please? This was really good. I am more of a chocolate girl but I do love lime so gave it a go. The glaze really makes it. I am not a big fan of MIM. I think it’s a texture thing plus there’s a certain flavor from using the grain free flours. So to have the glaze to cover it up was great. Delicious recipe, thank you! Thank you Janet! I totally get the texture thing. I have issues with that on certain things myself. So glad to provide you a recipe that you enjoyed!